Searching for an inexpensive laundry detergent alternative? Here are a few effective alternatives you might want to try. Conventional laundry detergents are expensive, hard on the environment, and can irritate your skin. But they’re not your only option. Check out these effective laundry detergent alternatives. Baking soda (a.k.a. sodium bicarbonate or sodium hydrogen carbonate) cleans and deodorizes clothes and works as a water softener, eliminating the need for fabric softener. Plus, you can mix it with soap for an extra clean load of laundry. A plain, natural soap without additives or heavy fragrances is an excellent laundry detergent alternative. After all, if it’s good enough for your skin, it should be good enough for your clothes. Mix with baking soda or borax for deodorizing. Borax (a.k.a. sodium borate, sodium tetraborate, or disodium tetraborate) cleans, deodorizes, softens, and brightens clothes. 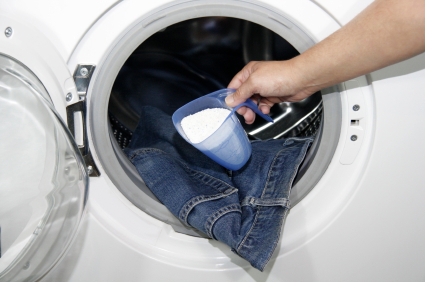 Plus, borax can help remove soap residue from your laundry, which can make your clothes look dull. Mix with soap for the cleanest clean. Washing soda (a.k.a. sodium carbonate) is similar to baking soda except that it will also disinfect your laundry and remove stains. It can also be used to pretreat heavily soiled laundry. Mix with soap and borax for an inexpensive laundry detergent alternative. There are plenty effective alternatives to conventional laundry detergents, and they often work just as well or even better. For more laundry tips, talk with an attendant at one of our many laundromat locations in New Jersey. We look forward to your visit.